Well-proportioned curves. The unmistakeable harmonious proportions and lovingly handcrafted details of the flaye table really make it stand out from the crowd. The leather frame allows you to customise the colour of your table and gives the tabletop a fine, delicate appearance. Sophisticated design ensures the soft curves of the tabletop and frame blend together as a whole. 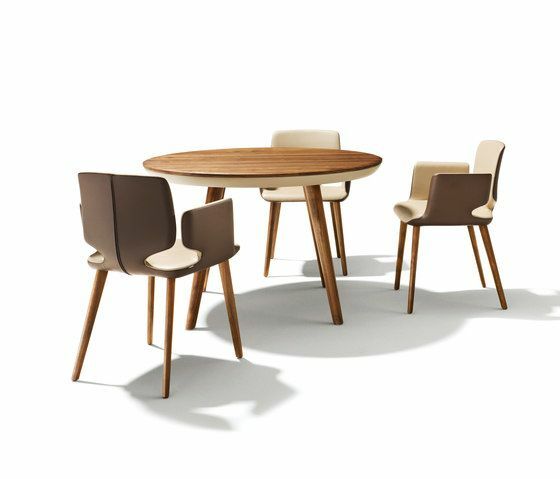 The flaye table is available with a choice of wooden or leather frame and a round or rectangular tabletop. Conical solid wood legs with a sophisticated, drop-shaped cross-section and edges featuring precise curves, highlight the high level of craftsmanship associated with TEAM 7.